Calm traffic and create a safe pedestrian environment by slowing down vehicles with the speed bumps. The modular design allows multiple speed bumps to be placed next to each other to create a custom width to span roads, parking lots, and more. 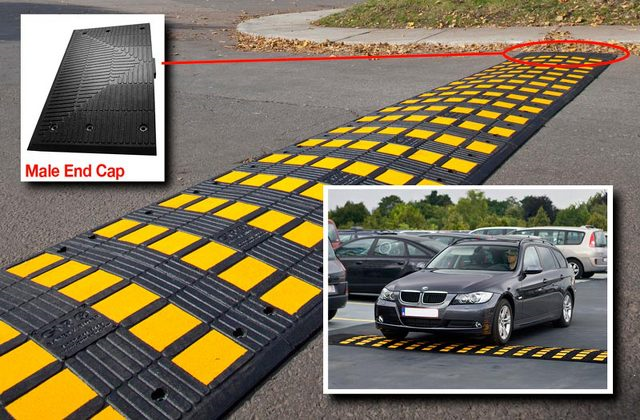 On the bottom of the speed bump are dual channels to protect cables and hoses. bber that will not break, chip, or crack, the 4' modular speed bump is ideal for locations such as schools, hospitals, hotels, parks, sporting events, parking lots, and commercial, industrial, and residential areas. Includes a one year manufacturer's warranty. The rubber parking curb works great in retail, commercial and business parking lots or garages. The 6 foot car stop is constructed from rubber and includes reflective yellow strips for visibility. These parking blocks won't chip or crack like concrete and are resistant to damage from gas, oil, UV light and moisture.